This summary explores the involvement of service users in quality assurance and service evaluation processes. It explores the evidence around what has worked and has not worked, what benefits can be achieved from user involvement in data collection and what can be learned from previous examples. We drew on a wide range of evidence, including academic research in the fields of health, social care and education in relevant databases (e.g. ASSIA, ProQuest Public Health, SCIE Social Care Online, Social Services Abstracts) and recommendations from specialist organisations (e.g. Care Inspectorate, Evaluation Support Scotland, NHS INVOLVE and SSSC). We searched the academic databases, Google Scholar, search engines and key websites using a broad range of terms including variations on concepts including action research, collaborative assessment, evaluation, consumer participation, co-research, emancipatory research methodology, patient and public involvement (PPI), patient and service user engagement (PSUE), participatory research, peer interviewer, user interviewer, user involvement, and user participation. We have provided links to the materials referenced in the summary. Some of these materials are published in academic journals and are only available with a subscription through the The Knowledge Network with an NHSScotland OpenAthens username. The Knowledge Network offers accounts to everyone who helps provide health and social care in Scotland in conjunction with the NHS and Scottish Local Authorities, including many in the third and independent sectors. You can register here. Where resources are identified as ‘available through document delivery’, these have been provided to the original enquirer and may be requested through NHS Scotland’s fetch item service (subject to eligibility). In a social care context, quality assurance can be understood in different but related ways that generally refer to ensuring that services are delivered to a high standard and that good outcomes for service users are ensured. In validation inspections, the Care Inspectorate looks at providers’ quality assurance systems and “how they monitor and ensure good outcomes for people”. The Nursing and Midwifery Council states that “[q]uality assurance makes sure that education programmes meet our standards and that risks are managed effectively”. Quality assurance processes may support continuous improvement in service delivery and identify possible development opportunities (Turning Point Scotland 2011). The National Council for Voluntary Organisations (NCVO) has designed a Practical Quality Assurance System for Small Organisations (PQASSO) quality assurance system to help organisations run “more effectively and efficiently”. Within their system of quality assurance, they include sound governance practices, financial and risk management procedures, and a robust system for measuring outcomes. This review focuses on service user involvement in data collection, which falls into categories two and three. This workbook is a practical tool to help organisations plan why, when and how to involve the people they work with in evaluation. It includes case studies, recommendations and resources for developing participatory approaches to service evaluation. This Outline focuses on service user involvement in Step 2 of the workbook - collecting information, specifically where data is collected from the service user by previous service users. ESS state that “there is a range of different degrees to which organisations might involve people they work with in evaluation”. In their description of greater involvement, people may be involved in doing some evaluation work and controlling the evaluation process. The report also includes case studies where organisations have involved the people they work with in planning evaluation. The following studies provide examples of research around user involvement in data collection for research and/or service evaluation. It must be acknowledged that research indicates a positive bias in publications around patient and public involvement (PPI) in health (Tierney et al. 2016), and that other research around service user involvement in other fields may be similarly biased. Additionally, the question of how service user involvement can affect the quality of knowledge generated by research has been raised (Entwistle 2010). However, the examples provided below may be useful for the specific enquiry this report seeks to support, which focuses on engaging service users in service evaluation, specifically in the data collection process. This paper explores a number of key issues relating to the employment of peer interviewers by reflecting on a project designed to explore the views and experiences of parents who use illegal drugs. The project presented the research team with a number of challenges. These included the need to provide ongoing support for the interviewers, a sense of distance felt by the researchers from the raw data they collected, and the difficulties of gaining from the skills and experiences of peer interviewers without exploiting their labour. This article is a collaboration between an academic researcher and four older people who worked together on the evaluation of a pilot project in Gloucestershire, with the aim of ‘making care homes part of our community’. Against a background of increasing public participation in research, we explore the role of ‘community researcher’ and the experiences of those involved. The article starts with an overview of policy and practice developments in relation to public engagement in research. The author undertook a small-scale research study to obtain the views of users, carers and social workers regarding their perceptions of change. He discusses how as part of the research design he worked with a voluntary organisation and commissioned users to interview other users. He examines the advantages of adopting such an approach, and how this experience changed his thinking about user involvement. He suggests that more efforts need to be made if user involvement is going to progress beyond the participation level. He argues that if real change is to take place, the balance of power has to be shifted. This paper discusses learning about service-user and carer involvement from an action research (AR) study into self-directed support implementation in one English mental health trust. It explored how patients and carers in eight diagnostic research specialties have been involved in research, their motivations and the impact involvement had on them. Using an online semi-structured questionnaire (143 patient respondents), the authors identified several benefits of involvement in research. 14% of respondents were involved in the collection of data or implementation of intervention. The authors suggest that participation gave co-researchers a powerful and effective voice in this service redesign. Benefits of patient and public involvement (PPI) included: psychological and social benefits; intellectual benefits; and and improved relationship with illness and crisis. The authors suggest that action research can be a suitable method to enable service users to undertake research, but that guidance and support is required from lead researchers. This approach revealed more authentic research data and required professionals to be more accountable for their perceptions and to make explicit their understandings throughout the study, which enabled more effective working. Concerns raised included tokenistic involvement and whether their contributions had been factored in to the research. This study aims to investigate the impact of involving patient representatives as peer interviewers in a research project on patient empowerment. 18 interviews were carried out as part of the wider study, seven by the academic researcher alone and eleven jointly with a peer interviewer. The interviews were analysed quantitatively and qualitatively to explore potential differences between interviews conducted by the researcher alone and interviews conducted jointly by the researcher and the peer interviewers. A phone evaluation of the peer interviews was carried out with the research participants, and notes were thematically analysed to understand their experiences. Differences were identified between the academic researcher and the peer interviewers in the types of questions they asked and the degree to which personal narrative was used in the interview. Peer interviewers varied significantly in their approach. Research participants were positive about the experience of being interviewed by a peer interviewer. No firm conclusions could be made about impact on outcomes. 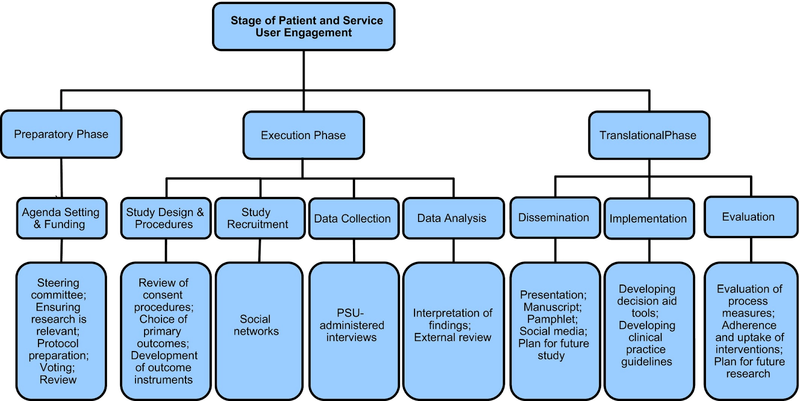 The authors took 37 sources describing frameworks/conceptualisations of PSUE and built a synthesised framework comprised of three broad phases of research (preparatory, execution and translational phases) and the specific stages within them to illustrate the ways PSUE can be operationalised. The authors identified several benefits of PSUE described within the research papers they analysed, including that PSUE “allowed PSURs who were uncomfortable with questionnaires to participate – for example, engaging key PSURs as trained research assistants in collecting and analysing data. Approaches to addressing these challenges included fitting the research methodology around service user needs and constraints and enabling service users to engage on their own terms. In most instances this involved one to one interviews as a research method, with users deciding the time and venue. Building trust was identified as a crucial component, as was enabling the user interviewer to pursue their own interests and motivations for being involved in data collection. This study explores service user involvement in the development of multi- disciplinary mental health guidelines in the Netherlands. It uses document analysis, interviews and observations to identify how multidisciplinary mental health guidelines have taken service user perspectives into account and highlights the themes and associated barriers and facilitators of service user involvement within these guidelines. The themes include issues relating to the process of service user involvement. The authors suggest the insights they provide into facilitators and barriers “will aid in the planning, monitoring and evaluation of service user involvement”. Whitley reports that some clients, even some with serious mental illnesses, were “quite capable of quickly understanding the scientific basis of research” and that several participants were highly qualified prior to needing support from the service due to mental illness. Other clients had less understanding of the scientific basis of research, which he suggests may mean some time may need to be spent supporting participants to understand methodologic issues. The authors describe a process of qualitative data analysis in a mental health research project with a high level of mental health service user and carer involvement, and reflect critically on how they produced their findings. They discuss how patient and public involvement led to the discovery of complex findings that would otherwise have been missing and describe how this was achieved through the coproduction of knowledge and methodological flexibility, and deliberate and transparent reflection throughout the process. This research sought to engage service users as both participants and as co-researchers in a study of the experience of drug problems in three Dublin communities. The work adopted a community participatory methodology. Reflecting on their experiences, the authors describe how meaningful collaboration demanded the added task of training members of the community in research methods, including data collection and analysis. Other points include that “supporting community researchers from the grass roots strengthened the study but was time and resource intensive”, and that “community researchers struggled to appreciate that their viewpoint was valuable and valid”. The authors discuss the benefits of community-based research, including that “some of the most insightful data gathered came from local contacts and community sources and university researchers would not have had access to this without the community researchers”, and that “local knowledge and being known locally were parallel aspects of successful recruitment of participants”. Users will need to understand how to collect data. This will require training and/or a previous knowledge of conducting research. This will also require researchers to acknowledge users’ involvement as a member of the research team. Seek advice from the BRC User Involvement Manager (see page 14 for contact details) regarding the protocols associated with involving users in data collection. Seek the opinion of users already involved in the project as members of the steering group or advisory panel, about the appropriateness of having users collecting data. Ask for volunteers from those already involved in the project steering group. Recruit specifically for users interested in undertaking data collection. This allows you to stipulate certain requirements and skills for the role. Liaise with the BRC User Involvement Manager (see page 14 for contact details) about training for users in data collection techniques. This report from a study involving in-depth interviews with 48 people describes what made mental health recovery possible given particular circumstances and conditions. This report provides information about the recruitment and training of the involvement researchers. Training in research methods was delivered by a mental health survivor research consultant and support during data collection and analysis was provided by the Rethink research team. In the report the researchers provide a reflection on their experiences of taking part in the study, which included interview design, analysis, write-up and dissemination of findings. Suggestions for carrying out similar work are provided, including recommendations for payment, facilitation, expectations around communication, skills support, fair allocation of work tasks, considering the abilities of user researchers, stress in the research process, supervision and support, and confidentiality. This report includes three case studies (1-3) in which service users and carers were involved in the data collection element of research. The case studies report on how service users and carers were involved, the impact of involving service users and carers in the different stages of research, and lessons learned. A combination of internal self-assessment and audit processes, and inspection by external agencies helps services to focus on continuous improvement in service delivery. Additionally a staff appraisal system offers the opportunity for staff and managers to consider how staff performance affects the quality of service delivery and to identify possible development opportunities. It is important that the people who use services are given the opportunity to play a part in assessing the quality of service delivery, and to give constructive feedback to staff on their performance.